Hi friends! My name is Laura. I’m a Minneapolis (soon-to-be Chicago) based wedding and portrait photographer. I also dabble in real estate and manage rental properties as a supplemental income. My biggest passions are learning and exploring. I do this through travel, adventuring, connecting with super cool people, yoga, reading, listening to podcasts, practicing spirituality, and studying the universe (Abraham Hicks and Eckhart Tolle, anyone?). I'm pretty lucky that I can work remotely in the winters, and I'm currently in the midst of a five month trip. I spent the first three months in Budapest, and now I'm in Bali, Indonesia for two. I prefer slow travel and really settling in to new places whenever I can. It’s so hard to pick a favorite destination because I like so many places for so many different reasons. Truly, every place I’ve been lucky enough to visit has made a lasting impact and I feel like I grew as a person in one way or another. I’m currently in Bali for the second time, and it’s definitely up there on my list of favorites. Bali is a magical island with the most incredible, hospitable people. 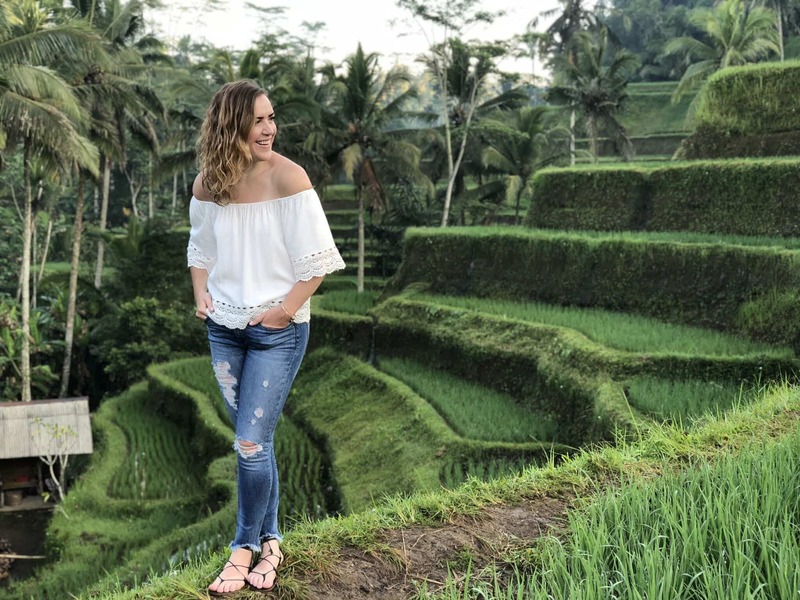 Did you read or see “Eat, Pray, Love?” It really put Bali, especially the town of Ubud, on the map as a spiritual destination. 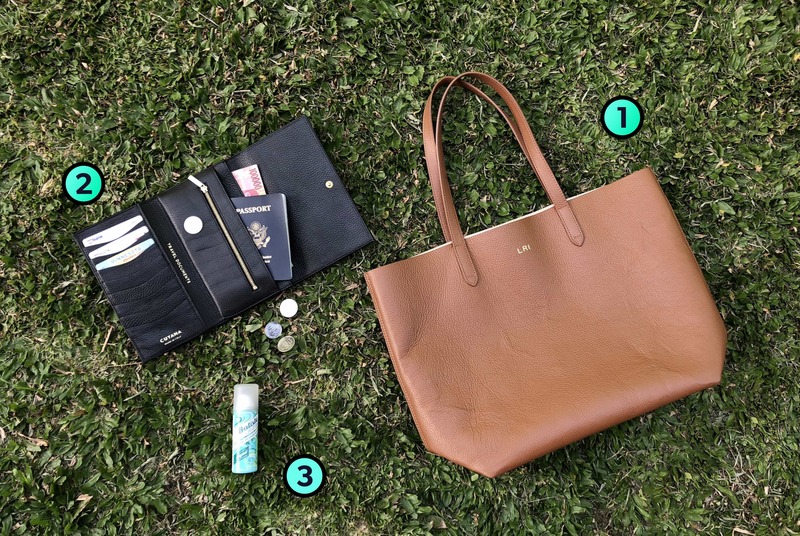 Cuyana Tote: My number one item I can’t travel without? A beautiful tote. I love this one from Cuyana because it’s structured instead of slouchy. It’s HUGE and on airport travel days holds all of my essentials (including my laptop and bulky medium format film camera). I’m a self-proclaimed minimalist and I don’t generally buy travel gear that isn’t multifunctional and also useful in everyday life. Since moving out of my house, renting it out and traveling long term, I’ve really pared down on my handbags and all of my accessories and clothing in general. But this tote stands the test of time and is a staple in my closet and travels. In addition to using it on travel days, I use it almost daily as well. It’s a great beach bag, a shopping bag (don’t use plastic, people! ), and an everyday bag for hauling my laptop and hard drives to coffee shops to work. Cuyana Travel Wallet: I’m going to sound like a Cuyana advertisement, but hey, if you find a brand you love (and I love their ethics and philosophy too!) you stick with ‘em! I love, love my Cuyana travel wallet. I get compliments on it constantly, both at home and on the road. It holds my passport, boarding passes (not all countries/airlines use or accept mobile boarding passes), has three currency slots incase you’re hitting different countries, and a zipper pocket for coins. It’s large enough to carry as a clutch for evenings out, and will fit my iPhoneX (or an 8+ too). I got it in classic black, because I love the versatility. Bastiste Dry Shampoo: Dry Shampoo. Ladies (and gentlemen rocking the longer locks), it’s a must. When I’m traveling I don’t always want to waste precious time washing my hair. Dry shampoo to the rescue. I love Bastiste because it smells really good, and dissolves perfectly into my roots. It doesn’t leave my hair feeling matted or sticky. I swear it’s pure magic. Packing cubes! I swear by them! They keep me so organized and make it easier to NOT unpack your entire suitcase if you’re just staying somewhere for a night or two and moving on. I never roll my clothes, I like them flat (and as unwrinkled as possible) in my cubes. I’ve packed for several month long trips in a carry on, so I can confidently say that cubes maximize space and the amount of clothing you can bring along. Another hack (that really applies to my life and travel) is that I stick to neutral colored, multi functional pieces. I like to keep things simple – usually distressed denim jeans or cut off shorts depending on the weather, and basic tees and tanks. I can dress up my outfits with accessories that are small and easy to pack, like funky earrings. Or better yet: buy the bold jewelry in the new places I visit. Another hack that should be pretty obvious: wear your largest items on the plane to maximize space in your suitcase. If you’re headed somewhere cold and need a parka and boots, wear ‘em while traveling. Bonus for my female friends. Yeah, I’m gonna go there. Menstrual cups. Save the earth, and save yourself the trouble of trying to find tampons in obscure places. Admittedly they take a bit of getting used to (definitely use them at home before taking them on the road! ), but once you get it down, you’ll be hooked. A second thing would be a book compression system. I know you’re gonna laugh and say, um, get a Kindle, but I just love physical books. Unfortunately, they are the worst to carry because they’re so bulky, but it’s a necessary evil if you’re reluctant to go digital. Crystals. I always carry a small citrine stone in my wallet (promotes financial abundance) and wear a smoky quartz on a pendant around my neck. Smoky quartz is thought to ward off negativity. Any other general travel stories, advice, or packing/organization tips you’d like to share? Research the visa and entry requirements of the country(ies) you’ll be visiting before you depart. I’m a very go-with-the-flow kind of person, and sometimes I find myself in places I didn’t plan on. BUT, I’ve also had enough visa snafus to know that when it comes to certain things, research and planning is a must! Follow Laura's adventures on her website or Instagram.